Landscape lighting design for your home or business is important if this is something that you are considering and, once you know more about it, it is most certainly something that you will want. What many people do not realize is all of the benefits you can expect from this service, as long as the layout is designed and installed by a true industry professional. 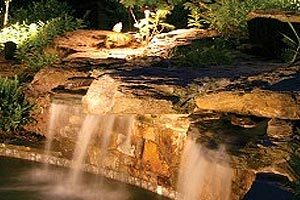 For one thing, lighting for your Howell landscaping is ideal for highlighting the details that you want noticed, that much is obvious. But did you realize that well placed lights can also help to take the focus off of any aspects of your home or property that might be considered more of an eyesore. So this lighting adds to the curb appeal but it also offers an important level of safety and security. Criminals seek out dark homes in order to gain entry and go undetected. A well-lit house is one of the last places a thief or vandal will pick for criminal activity. Plus, this added lighting makes it much easier for you, your family and your invited guests to maneuver around the exterior of your home safely, without the likelihood of tripping and falling. One of the most common misconceptions is that this type of lighting is something that can be a DIY project or carried out by someone who is a professional house painter and does this on the side. There is a science to lighting placement and should only be carried out by a professional. But don’t worry, once you realize that the professional design and installation route is just as cost-effective, you will only wonder why you put it off for so long. You can work with a professional, like our team here at Rainmaker Irrigation, in order to express the goals that you have and what landscape features you want accented. We can even help you better understand options that you have, such as low voltage landscape lighting, in order to save money on your energy costs and make your landscaping that much more environmentally responsible. Or, even if all you need is skilled service or repairs for your existing outdoor lighting system, we can help with that as well. Rainmaker Irrigation wants to be able to help you understand the options that you have for landscape lighting, including making sure you know more about the high quality brands that we offer, Kichler for example. Our top priority is to be able to provide the best quality products and service while ensuring that you also save money. We want you to be able to enjoy the benefits of both worlds – stunning landscaping aesthetics with eco-friendly landscape lights that will save you on energy costs. If you would like to learn more about Landscape Lighting, please call 734-564-1373 or complete our online request form.